Where else can an otherwise perfectly rational, frugal set of parents throw common sense out the window and happily pay $40 for their daughter to have lunch with Princesses or $15 for a balloon that will deflate almost immediately. There’s just something about the Happiest Place on Earth that makes spending ridiculous amounts of money seem like fun. Until you return home, the credit card bill arrives and suddenly all that fun seems a little less magical. With some careful planning though, your family can experience all the fun that Disney has to offer without breaking the bank. As with any vacation, be realistic and only plan what you can truly afford—but if Disney has been on your family’s bucket list, there are smart ways to save on your trip. Be aware that ticket fraud for Disney is common practice, so always be sure that you’re buying from a reputable dealer. Undercover Tourist is one of the few reputable discount ticket sites. It offers discounted tickets to Disney World, Universal Orlando Resort and SeaWorld. The site also offers trip-planning help and advice, complete with maps and crowd predictors. While it may seem like visiting more than one park a day is the best way to get the most bang for your buck, the opposite is actually true. This ticket upgrade allows you to visit multiple parks in one day, but it’s an extra $40 to $60 or more. Trust me, there’s plenty to do in each park without having to jump around between parks in the same day. At WDW, the theme parks aren’t that close together, which means that if you want to make the most of your time, you won’t want to waste an hour or more traveling between parks. The only exception to this: it may be worthwhile at the California Disney parks, as Disneyland and Disney California Adventure Park are right next to each other, so if you’re only on a 2-day stint, Hopper can help you maximize your time. Speaking of, be sure to plan which parks that you want to see, especially if you’re going to Disney World, where there are four big parks: Magic Kingdom, EPCOT, Animal Kingdom and Hollywood Studios. Without the Park Hopper ticket, you can still easily spend a day in each park. Consider the Annual Pass if you visit Disney World more than 2 or 3 times a year, depending on the length of your trips. Members of the military can receive discounted rates for themselves or their spouse and up to six family members with Disney World 4-Day Military Promotional Tickets (which include Park Hopper) or Disneyland 3-Day Park Hopper Tickets. This is only valid certain times of the year and the military discount may change, so check the Disney World Special Offers page or the Disneyland Offers & Discounts page for current military (and other) promotions. If you live in Southern California or Florida, you can receive discount passes during off-season periods. These discounts often apply to the Annual Pass as well. (Please note that while the standard Annual Pass offers no Blackout dates and free parking, your discounted pass may not.) Deals and dates vary, so make sure to check the website(s) for current offers. Hotels outside, but near the park, know that they have to offer discounted rates and better deals to attract frugal tourists. Check sites like Priceline, hotels.com, Kayak or Expedia can help you get the best deals around. Keep in mind though, that while you might find hotel rooms for $60 a night or less, you do get what you pay for. Make sure to read reviews on Yelp and decide what you’re willing to pay for the experience. You can also try Airbnb, which have some really nice hosting options that are affordable and very close to the parks. And remember that, while a good night’s sleep is important, your real vacation activity is during active hours at the park anyway. By planning your trip around the off-season and during the weekdays, you can really save a bundle. If the kids can miss a few days of school, you’ll save quite a bit by not going during normal vacation times. If you don’t want to pull you kids from classes mid-week, there are other options, too. Highest attendance levels are usually around the major holidays, so it’s best to schedule your vacations between holiday breaks. Noe that temperatures can be as low as 45 degrees, even in California, so bring coats and hats when it’s cooler. Always look up current park hours during off-season, as they may be different than the summer schedule. These days, renting an RV can give you the comforts of home at a reasonable price. If you don’t mind roughing it for a few days, there are several campsites close to both parks. Ok, in California, it’s more like camping in a parking lot—after all, you’ll be in the city—but it can still be a fun adventure the kids can enjoy. Most sites offer showers, close access to fast food and electricity—so even “roughing it” may not seem quite rough. If you’re Disneyland bound, try Anaheim Harbor RV Park. It has clean bathrooms and it’s only a 15-minute walk to the parks. In Florida, Disney’s Fort Wilderness Resort is a great option. The campsites are reasonable at $50 a night and offers terrific amenities, including a fun boat ride to the Magic Kingdom. Please note though that the campground is pretty big, so try to pick a site as close to the dock as you can. Food at the parks is quite expensive, but can also be appealing—for ex. $4 pineapple whips—yes they’re pricey, but absolutely delicious. I recommend planning, budgeting and make sure to eat a full breakfast before you head to the parks. First of all, make sure to have a good breakfast before you start out. Pack a reasonably-sized cooler with lunches and keep non-perishable snacks in your purse. (You can bring in outside food). You can also keep your lunches in the park’s lockers for easy access. They’re not free, but they’re worth a few extra dollars. Try to pack snacks like energy bars, nuts and whole fruit. You can save even more money by making some of these snack items in your pre-vacation prep with your kids. Often, in the hot sun, on the pavement and standing in line, dehydration can hit hard and fast. There are plenty of bathrooms and drinking fountains, so refilling a water bottle will really help. You can also try a grocery delivery service to the hotel. Even if you just get some basics like bread, peanut butter, and bananas, you will, at the very minimum, save yourself from major breakfast purchases and hold out for lunch. Most surrounding hotels have a list of local grocery delivery services, just ask for this amenity at the desk, or better yet, before you check in. In California, go for Vons Online Grocery, where your first delivery is free. In Florida, opt for Garden Grocery, where the delivery fee is only $2 for orders over $200—a good deal for a long family stay. The Disney Dining Plan is a component of Disney’s Magic Your Way vacation packages. These packages are worth checking out, depending upon when you travel, you can save a bundle. They also help streamline your travel plans for many people because you can take care of budgeting out everything, including flight, hotel, airfare, park tickets, food, all before you go. Bringing along a favorite book or shirt is a great way to collect autographs from all the characters you meet while walking around the park. Your kids will love collecting the signatures and they’ll go home with a great (and free) souvenir. Be sure to take lots of photos! Work with your kids before the trip to set a budget. Kids respond surprisingly well to this and I’ve even seen them get quite into it. (For example, “I would like this item, but I only have $9 dollars left, and I know I’ll want this other thing more later…”) It’s a great opportunity to teach some valuable life lessons and it will help them value what they purchase a little more. Another great tip is to plan ahead and budget your time. Know that you can enjoy the park’s offerings, rides and activities without also bringing home “stuff,” or paying for extras. Talk with each other about what you really value and remember that the memories that you make at your Disney trip are the most important part. My favorite book for making the most out of our time and money at Disney is the Unofficial Guide, which has actual action plans that you can follow to maximize your time in each park. It also ranks each attraction and each restaurant, and offers the very latest in insider tips so that you can tackle the park like a pro, even if it’s your first time. Plan ahead, but try not to overdo it. Give yourself and your family some wiggle room by giving yourself a free day in your schedule. Pick a day in the last two thirds of your vacation so that you can decide as a family on what no one wants to miss. Go exploring a little bit and make sure to let the kids have some free play time, too, so YOU can relax and enjoy the moment. Most of the hotels in the Orlando and Anaheim areas are family friendly and have great pools, and if you are staying at an actual Disney property, you will definitely want to have time to enjoy the facilities. 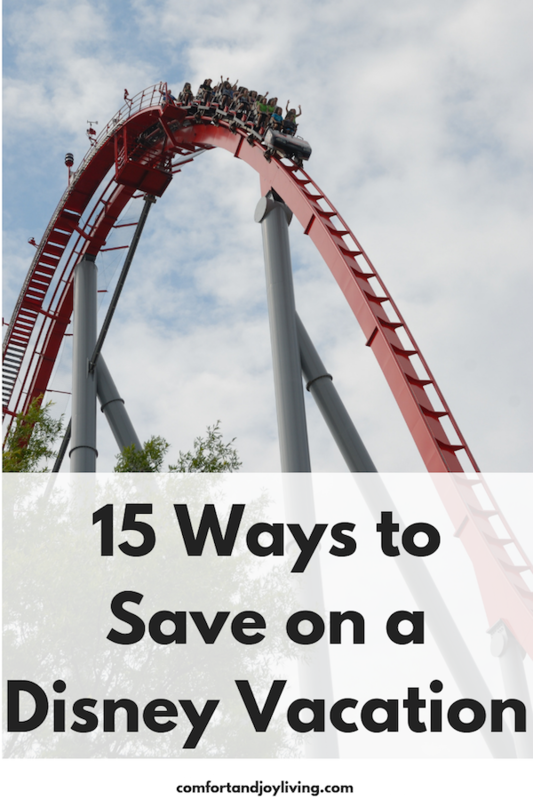 Do you have any tips on saving on a Disney trip?